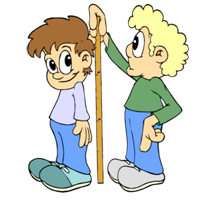 Measurement is expressing the size or amount of objects or events using numbers. Cooking – an appropriate amount of ingredients results in a delicious cake. Building –an accurate length and weight of supports helps the house to stand firmly. Travelling – a sufficient amount of fuel is needed to reach the destination. A system of measurement is a set of units grouped to be used on several applications. There are two systems of measurement that currently exist. These are the Metric system and the English system. The metric system is the most commonly used system of measurement. The main feature of this system is the standard set of base units and the use of prefixes in powers of 10. The table below shows the base units used in the metric system. Metric ton (t), which is equal to 1000 kilograms (kg). Cubic centimeters `(cm^3)`, which is equivalent to 1 milliliter (mL). Area (a), which is equal to 100 square meters `(m^2)`. Hectare (ha), which is equal to 100 ares (a). The Metric System uses Greek prefixes inserted to base units to distinguish unit levels. Each prefix is equivalent to a certain power of 10. In centimeter, the prefix "centi:" means one hundredth. So, centimeter means one hundredth of a meter. Thus, a centimeter is equal to ¹/₁₀₀ meters. The symbol is cm (c for centi and m for meter). In milliliter, the prefix "milli" means one thousandth. So, milliliter means one thousandth of a liter. Thus, a milliliteris equal to ¹/₁₀₀₀ liters. The symbol is mL (m for milli and L for liter). In kilogram, the prefix “kilo” means one thousand. So, kilogram means one thousand grams. Thus, a kilogram is equal to 1000 grams. The symbol is kg (k for kilo and g for gram). Today, the metric system is changed into the International System of Units or SI. The English system is a system of measurements used in countries like the United States and United Kingdom. Unlike the Metric System, the English System does not use Greek prefixes to distinguish unit levels but instead uses another unit.. Compared to the metric system, there is a lot to familiarize in the English system since there are different units with different conversions. This is the reason why the metric system is preferred more than the English system.